Join us as we celebrate entrepreneurship and recognize the accomplishments of small businesses at the 12th Annual Spirit of Small Business Awards. The Los Angeles SBA District Office and Pacific Coast Business Times are pleased to announce the 2014 award winners. 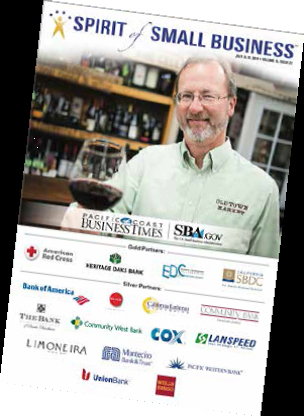 The Spirit of Small Business honors businesses of fewer than 100 employees in these categories: East Ventura County, West Ventura County, South Santa Barbara County, North Santa Barbara County, San Luis Obispo County, Minority-Owned Business, Women-Owned Business, Exporter of the Year and Green Business. West Ventura County - Staples Construction Co.
Cosponsorship Authorization # 14-0914-146: The U.S. Small Business Administration's (SBA) participation in this co-sponsorship is not an endorsement of the views, opinions, products or services of any cosponsor or other person or entity. All SBA programs or cosponsored programs are extended to the public on a nondiscriminatory basis. Reasonable arrangements for persons with disabilities will be made if requested at least one week in advance. Contact: Patrick Rodriguez, 330 North Brand Blvd., Suite 1200, Glendale, CA 91203, (818) 552-3222, patrick.rodriguez@sba.gov.